New York, New York: Taglialatella Galleries is pleased to present an exhibition of 12 unique Andy Warhol canvases. The show will run from September 18th- October 4th, 2014 at Taglialatella Galleries’ Chelsea location. The exhibit opens with a private invitation only reception on the evening of Thursday, September 18th, 2014 from 6:00-8:00pm. The commissioned portrait represents one of the most monumental aspects of Andy Warhol’s spectacular career. 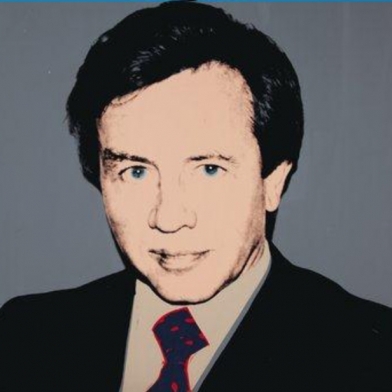 Warhol virtually re-invented and re-energized the tradition of portrait painting in his lifetime. Recognizing the primacy of photography in modern life and in particular the power of the close cropped Hollywood style still portrait that was so universal in commercial culture, Warhol revolutionized the art historical tradition of the painted portrait. Taglialatella Galleries is pleased to present an exceptional selection of portrait paintings on canvas created by Warhol during the 1970’s and 1980’s. This presentation of museum quality portrait paintings depicts a suite of European gentlemen, several are men of extraordinary accomplishment and social standing while a few are relatively unknown, obscured by time. It is a rare privilege to experience a diverse collection of Warhol society portraits together as a whole. Exhibited publicly for the first time this year, this collection of paintings has been acquired directly from the archives of the Andy Warhol Foundation. 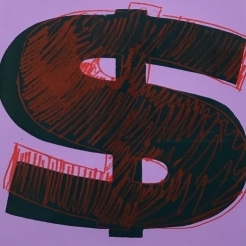 Each canvas is painted in Warhol’s traditional forty by forty inch square format and combines his revolutionary synthesis of photography and commercial printing techniques with the power and physicality of paint and color, and the hand-brushed gesture. In the more than a quarter century since Warhol’s untimely death there has been a growing appreciation of the greatness of his portrait work. It has taken time for these portraits to be removed from associations with money and commerce, and distanced from the social elitism and worldly fame of his subjects for us to truly see these canvases as powerful works of art in their own right. It has taken time as well for the prescience of Warhol’s preoccupations with the power of the visual language of commerce, of celebrity and fame as well as strategies of social presentation and invention to prove so true.